Since in art, as in life, one does not escape oneʼs background, an artistʼs experiences tend to get reflected in the artwork. Having grown up in The Netherlands and having lived and traveled extensively in many European countries, I still find Europe a source of inspiration for many of my paintings. Often I find an unusual angle, a different way of looking at the world. The hunt is always on for different subject matter, for something that excites me. Whatever subject matter calls out to me though, I know that paint I must, for the sake of my soul. Born in The Netherlands where she attended the University of Utrecht, she studied languages and qualified as a Spanish Interpreter/ translator. Before landing up in California with her husband and children, she had lived in Madrid, London and Montreal. In addition to studying art abroad, she has completed numerous art courses and workshops in California. Originally an oil painter, she now concentrates on acrylics and watercolor. 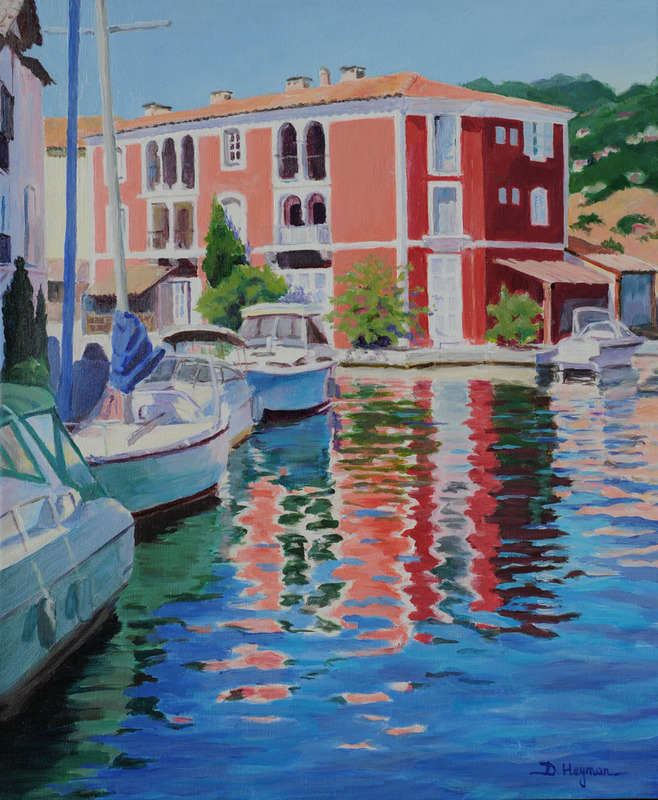 A signature member of the Georgia Watercolor Society, the Louisiana Watercolor Society and the Society of Western Artists, she has won numerous prizes and had several one-person shows, including at Stanford University and the Elizabeth Norton Gallery in Palo Alto and has been represented by a number of galleries, most notably in Carmel, California. She has lectured on her work at the University of California at Berkeley. Bold colors, good composition and strong lights and darks are hallmarks of her work, symbolizing joy and sorrow, which appear in different guises throughout her work. Her subject matter varies greatly: from landscapes – both foreign and local – people in various settings and water with reflections, to more unusual themes.